Lookout Mountain, located at the corners of Alabama, Georgia and along the southern border of Tennessee, is actually not a mountain at all but rather a plateau. We forgive them the name change because Lookout Plateau is a fairly lame tag. The "Battle Above The Clouds" took place here during the Civil War. The battle got its name from a unique weather event that occurs on the mountain in the early morning where fog starts to desced into the valley but actually stalls before it makes it. 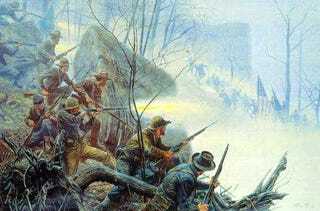 The battle itself wasn't intense, partially because of the difficulty of fighting along the mountain. In the end, not much changed because of the battle with neither side inflicting major casualties or changing the shape of the front. At best, it merely strained an already weakening Confederate army. Though Volkswagen will need a good name of it plans to battle for the mid-size market, our very own bmoreDLJ thinks it'll be decidedly more Tennessean. I'd name it "Ghibli", or possibly "Chattanooga."